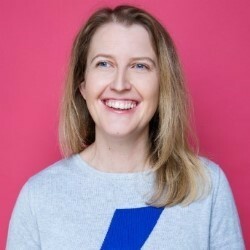 A disclaimer: at no point in her debut Fringe hour Heidi vs Sharks does Heidi Regan grapple with a great white. In fact, turning up and expecting that is virtually the only way you could be left disappointed. It's a charming, wonderfully weird show that promises a bright future for the Aussie comic. Following up her victory in last year's BBC New Comedy Award was always going to be a tough ask, but she's managed to match the hype and develop her act to new heights. Using an infantilised PowerPoint to guide us through a timeline of every shark movie ever (spoiler – it's all downhill after Jaws), she turns her niche passion into endearing, curious standup. It's ostensibly a whistle-stop tour through the evolution of the genre, but that's only half the story. She shifts into autobiographical territory with a surprisingly personal account of her own "timeline". The sharks are a mere conduit, you see – a comedic Trojan horse into her life. The result is a perfectly-weighted mix of silliness and heart, segueing between the merits of Shark Attack 3 and her fear of a privatised NHS with ease. She claims to be a slow burner, but it doesn't take long to be won over by her endless enthusiasm. She could transpose the shark gambit into a timeline of just about anything and the core appeal of her act would remain. On this evidence, the titular contest has a very clear winner.